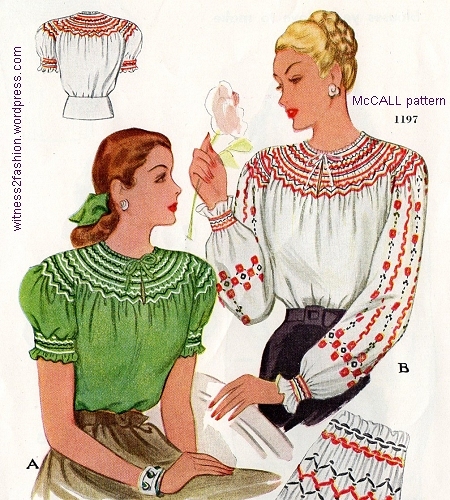 A variety of McCall patterns from the 1940’s showed glittering trim on simple tops. In the forties, McCall offered several patterns for simple tops which could be raised to evening wear status with sequins or beading. “Afternoon-evening” style implied a fashion that could be worn for dates when combined with your daytime business suit; a simple change of blouse and the working woman or traveler was ready for cocktails, dinner, and dancing. No. 1192, from 1945, was still featured in the needlework catalog for May, 1950. It included an embroidery transfer and instructions for applying the sequins one at a time, although you could also purchase strands of sequins by the yard. How to stitch sequins or do a decorative embroidery stitch. McCall 1192. You could also work it in bugle beads, or in six-strand cotton embroidery thread “for a more restrained effect.” A simple chainstitch was also recommended. Most of the ornamentation would be done before before sewing the side seams. Description of McCall 1192. Embroidery transfers came in blue, for visibility on most light colors, or yellow, for use on dark colors. McCall pattern 1283, from 1946. The blouse is simple, but the sequin trim is glamorous. Making a long skirt in matching fabric would give you an “evening gown” that could be varied with other tops. There was a time when a lady did not wear sequins in the daytime. However, late afternoon and the cocktail hour permitted a bit of sparkle. Witness to Fashion note: The wearing of metallic fabrics, rhinestone-studded clothing, and sequins during daylight hours was only beginning to be acceptable in the early 1970’s. I remember walking to breakfast with my husband in Hollywood one morning about nine; a woman passed us wearing tight jeans, high wooden platform heels, and a strapless sequinned stretch top, called a tube top. “Was she — or wasn’t she — a prostitute?” I asked to my spouse, figuring a man might pick up signals I was missing. He looked utterly bewildered when he admitted, “I don’t know!” A few years earlier, we would have had no doubts. Many forties’ dresses for late afternoon and evening have subtle sequin trim; some are not so subtle. Detail: a spray of flowers made from sequins and beads on a vintage dress. Black vintage dress with a “necklace” and sunburst of sequins. Another late forties detail: This blouse has beading around the neckline, suggesting a necklace. McCall transfer No. 1408 used beading to transform a very simple blouse into a sparkling one. You wouldn’t need to carry jewelry on vacation if you packed a blouse like this. Using an embroidery hoop, organza, tissue, (or modern tear-away stabilizer) to keep the fabric from stretching makes applying these trims easier. In 1950 you could choose among several neckline beading designs: a bow, a pendant, etc. More neckline beading designs from McCall. Pattern 1491. A bow on your shoulder or a beaded “brooch” could also trim your dress or suit jacket. McCall 1491. Gold or iridescent beads were available, but many of these patterns were used very subtly, in black on black, bronze on brown, blue on blue, etc. The square pattern below would turn a simple wool crepe suit into an elegant one, if you worked it in beads or shiny thread on the pockets. A square beading pattern like this would be subtle in black beads on a black suit jacket. Variations could be used on the neckline of a wool dress or the collar of a suit jacket. McCall 1314. If you’re tempted to make a dressy forties’ blouse, remember how often sparkle was added to day-into-night clothing. Pick a simple style, and let the ornamentation supply the sophistication. McCall 1404: simple longer-sleeved blouses embellished with glittering rays at the neck. Late forties. McCall 1293 included a vestee, a timeless halter top, a hat and a bag. Dated 1946. Picture that 1940’s halter with evening trousers or a short lace skirt; if you found it in a thrift store, would it scream “1946” to you? McCall 1293 included this Juliet cap and evening bag. This cap would not work over high forties’ hairstyles, but was perfect over a close-to-the-head fifties’ cut. A sequinned monogram on a blouse or dress was also worn by many — although I wonder whether monogrammed gifts are always appreciated by the recipient…. McCall transfer pattern 1339 supplied 5 inch high initials to work in sequins or embroidery thread. (1947) Swing, anyone? If you like the idea of adding sparkle, but not too much, consider an applique. I used to own several forties’ dresses which had bodice (and sometimes skirt) appliques of flowers — cut from printed material — and outlined or delicately accented with sequins. This dress does not have sequins, but a few on the appliqued tulip — clear or matching the colors — wouldn’t be out of period. This vintage dress has a solid rayon crepe bodice, a floral printed crepe skirt, and one motif — a tulip — from the skirt fabric appliqued to the bodice. A few sequins on that tulip would be fine. Obviously, this mannequin was too small for the dress; the flared, bias-cut skirt should hang from the natural waistline. A narrow self-belt probably accompanied this dress, but has been lost. It’s not too late to make your forties’ style holiday party blouse or dress! Holiday party aprons for little girls, McCall pattern 1281, from a needlework catalog for December 1946. Back in the mid-twentieth century, before women wore casual slacks or jeans to do housework, the apron was a useful, and often elaborate, handmade gift. Aprons were not included in the rule that gifts of clothing were too intimate for anyone but family members. Pattern catalogs and women’s magazines usually featured apron patterns in November and December; in my parents’ home, one sign that Christmas was approaching was the making of pajamas and aprons. 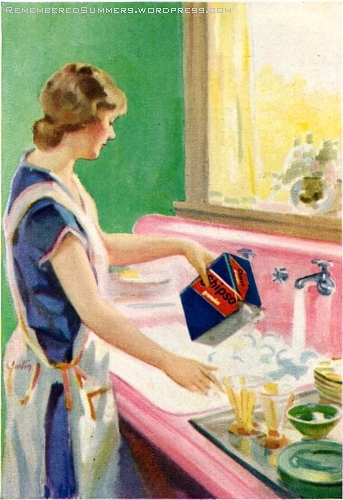 “Holiday Aprons” from Woman’s Home Companion, December 1937. Companion-Butterick pattern No. 7652. The elaborate backs of these aprons may be surprising to those of us who are used to modern, store-bought, unisex aprons. These were serious aprons that protected your dress. Back views and text for Companion-Butterick apron pattern 7652. Dec., 1937. “Triad” meant three designs in one envelope. This unisex apron set from 1950 shows the basic outline of inexpensive, utilitarian aprons like the ones in my kitchen today; in 1950 they were called “barbecue” aprons, and the idea of a man cooking and wearing an apron at home was no longer just a joke — although the gift aprons were often intended to be humorous. His and Hers barbecue aprons. McCall pattern 1515, circa 1950. This apron set, found in a McCall Needlework catalog from May, 1950, has elaborate appliques, and would probably have been intended as a gift set — made for a friend, or newlyweds, or intended to be sold at a charity bazaar. Aprons to make for a Charity Bazaar; Ladies’ Home Journal, October 1917. (In 1917, some skirts also had a ruffle at the waist.) Many women still wore “pinner” aprons, without straps, like those at right. Two versions of Butterick apron pattern 6874, from 1926. … but frilly, sometimes silly, labor-intensive aprons were a staple of holiday gift-making. You can see the pattern piece shapes for No. 917 from a copy in the CoPA collection; click here. Aprons like the ones below, often decorated half-aprons, were called “cocktail aprons” or “bridge aprons,” [for hosting card parties] and were worn while entertaining, not cooking or washing dishes. Apron decorated with sequinned hearts. McCall 1278, from a 1946 needlework catalog. I have also seen aprons with sequinned martini glasses on them…. Simplicity apron No. 1805, dated 1956. Starching and ironing those ruffles would be time consuming. This apron, McCall 1312, made from sheer fabrics and delicately appliqued, might be a gift to a bride. It evokes a fantasy of housework, unrelated to reality. 1950 needlework catalog. This one, decorated with Scottie dogs, is my virtual gift to The Vintage Traveler. McCall Scottie dog apron, before 1950. I prefer the version on the right. Many girls and women made aprons while learning to sew. A simple half apron was well within the abilities of elementary school students, and many a proud mother must have received an apron — far too pretty to wear — for Christmas, Mother’s Day, Valentine’s Day, etc. McCall apron 1096 — an appropriate Valentine gift. Photographed from a 1946 needle work catalog, but it dates to 1943. Simplicity aprons from 1956, pattern No. 1789. Even a beginner could make version 4, or apply rickrack, as in version 3. I found three McCall needlework catalogs (1946 to 1950) at an estate sale; some apron patterns were so successful that they appeared year after year, so a three-digit pattern number is often an indication that the pattern pre-dates 1946. This one first appeared in 1941 and was still in the catalog for November, 1950 — nine years later. McCall pattern 884, called the “Necktie” apron dates to 1941 and was still being offered in 1950 –and, possibly, later. Necktie apron, McCall 884. It is shown folded for ironing at the left. Rickrack was applied to the outsides of these aprons, McCall 987, from 1942. The tassels would be rather impractical. McCall apron pattern 1532, for women. May 1950 needlework catalog. The child’s version of McCall 1532 was McCall 1533. This Butterflies apron was also available in a child’s version. (From 1946) McCall No. 1257. A daughter (or little sister) version of the Butterflies apron was McCall 1258. McCall apron No. 1209 covered most of the dress. 1940s. “Kitchen pet of the career girl — this young apron … completely covers the dress. Pinafore ruffles give the smart broad-shouldered look.” McCall 1135. Circa 1945. The apron below is really unusual — but I’ll save the other aprons with novelty pockets for another day! A tulip forms a novelty pocket on this unusual, fasten-in-front apron. McCall 1403, from 1948. Although it looks complex, this apron would lie completely flat for ironing — more practical than it looks. Happy Thanksgiving! I hope you’re inspired to cook up something delightful.